Mentioning Adams and Yorobe in the same breath may be blasphemy. But the Tierrasanta resident is worshiped for similar reasons — especially on Facebook. “Beyond amazing” was a recent comment. “Phenomenal,” “brilliant, literarily,” “inspiring” and “Wow!!!!!!! X 100” are others. He sells calendars online — asking followers to name their favorite shots — and attends art fairs and farmers markets. But the 40-year-old son of a doctor father and publishing exec mother pays the bills as a healthcare IT specialist, “converting medical offices from paper records to electronic,” and working at Tierrasanta Medical Center. He used to be a DJ. “Since I am [on] contract, it is not a set schedule — so it is very flexible for my photography,” he says. The freedom let him become a social media sensation — with 14,143 followers on Facebook and 10,600 on Instagram, where he has 540 posts and countless shares. He’s also won critical acclaim at the San Diego County Fair, where he collects photo honors like moonrise images. Last year, Yorobe had 13 pictures on display. Nine won ribbons. Born at Sharp Memorial Hospital in San Diego, he attended St. Columba Catholic School in Serra Mesa and St. Augustine High School. 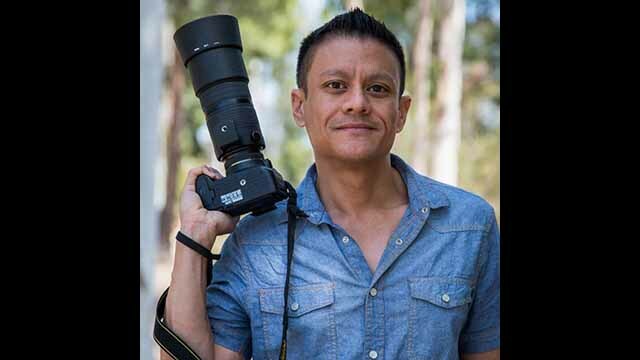 At UC San Diego from 1995 to 2000, he majored in psychology and learned photography. He began as a wedding photographer, whose couples-in-landscapes were the most popular, Yorobe told the San Diego Photo Club last November. About eight years ago, his hobby became an avocation. San Diego landmarks became his subjects — piers, the Hotel del Coronado, Point Loma Lighthouse, Balboa Park. Local experts hail Yorobe for his hard work if not his use of digital editing tools. Yorobe’s “unreal representations” are achieved through high dynamic range photography, he says. Berberick, the friend, has helped Yorobe shoot weddings and insists the San Diego native’s artistic integrity is beyond reproach. Berberick began following Yorobe on Instagram in 2014, and says Ev insists on single-exposure methods. The current coordinator is Gene Wild, who calls Yorobe one of many good photographers in San Diego. Living in Pacific Beach, Berberick has become a weather tipster for Yorobe, chatting daily by phone. Wild says it’s capturing the colors and luminance of San Diego’s sunrise and sunsets — sometimes with a drone. Not every prominent local shooter is enamored of Ev. Using a Nikon D800 or D750 digital SLR, often with a 14-24mm wide-angle lens, Yorobe gets up early or bargains with private property owners for scenic access. Last Fourth of July, he deployed his attractive girlfriend to chat up Point Loma residents, he told the Photo Club. They gained access to a house — and even got fed. The result was a stunning Big Bay Boom fireworks image taken from a rooftop. Times of San Diego: How did you learn photography, and where did you get your landscape skills? Evgeny Yorobe: I first learned photography back in college almost 19 years ago at UCSD. I learned on film and in the darkroom which I still feel helped me immensely when making the switch to digital. My landscape skills came from my innate love of nature and initially studying other people’s work. How long have you been shooting professionally — and sharing your images on Facebook? I’ve been shooting professionally for eight years now and sharing my images in Facebook for five years. Which of your images has gotten the most praise or Likes on Facebook? My sunset over the Carlsbad Flower Fields “Layers Of Color” has gone the most viral on my photography page, being shared over 4000 times. My photo “Risen” of the Full Wolf Moon rising over the Mount Helix cross received over 10,000 likes and 12,000 shares when it was resposted by the San Diego Reader on Facebook. What drives you to stalk these images? Do you prefer sunrise or sunset? What image took the longest to land? My personal love for the locations are a big driving force behind my work. I grew up around all of these San Diego spots, and I want to showcase them in the most stunning way possible. I would hope that my love for San Diego comes through in my photography. I prefer sunrise because there are fewer photographers and people out, and because it is less done so a little more unique. Which landscape photographers do you most admire or take inspiration from? Any favorite San Diego-based photographers? Have you studied Ansel Adams or others of his generation? I don’t really follow his work very much anymore, but Aaron Chang is definitely someone I admire just for being a San Diego icon and putting San Diego photography on the map. My favorite photographer is probably Alex Noriega. I have of course studied Ansel Adams and all of the greats, but I try not to look at their photos as much anymore to not be too influenced by their compositions. I’d prefer to find something unique with my own style, though I have found you can’t help but be influenced by them even when you are trying not to. 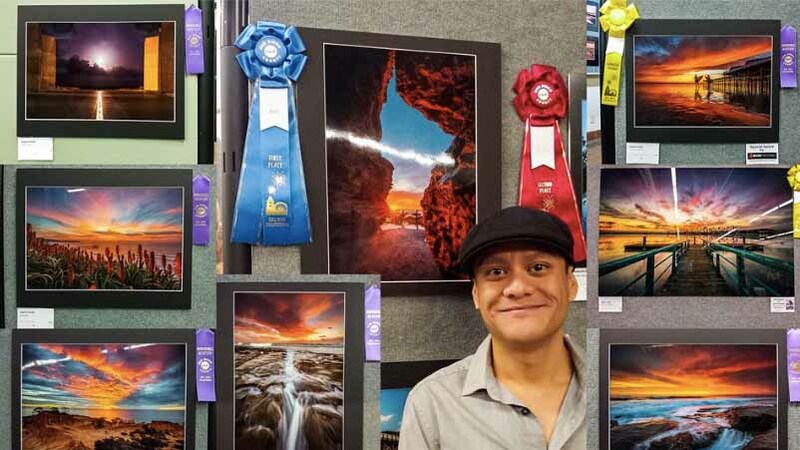 How long have you entered the Del Mar Fair photo contest? How many images displayed? Top awards won? Which images won the awards? I first started entering my landscape photography in 2014, that year I won two first-place ribbons and one fourth-place. I also won a first-place Ribbon last year (2016). You can see all of my awards and which photos here. What are your hopes for your new drone? I just recently purchased the DJI Phantom 4 Pro. I hope to get new and fresh perspectives on often shot San Diego locations. Do you ever shoot with film? What cameras? Why do you prefer digital? I rarely shoot film nowadays even though it is what I learned on. I still have my Nikon F100. I wouldn’t say I prefer digital, but the ease of use changes everything, especially in today’s short attention span world. I can get my sunset shot from that night out on social media within an hour of shooting it. Have you ever printed your own photos from film? B&W or color, or both? I have printed my film work, I actually learned in the darkroom in my first Photography Class. Both B&W and color. What kinds of workshops do you run? Which are most popular? I do 1-on-1 workshops for landscape photography and astrophotography (Milky Way photography). They are six-hour workshops that include four hours of shooting over two days and two hours of post-processing. The astrophotography workshops are my most popular. If you could shoot anywhere in the world, where would you go? Iceland and Patagonia are definitely on my list, as well as Cambodia. All professional photographers shoot hundreds of images before getting a “good” one. What is your ratio? How many shots do you take in a typical outing? When I first started doing landscape photography it was probably a 20-30 to 1 ratio. Now that I know exactly what I am looking for I don’t shoot as much and just wait for the right moment. I would say a 5-to-1 ratio nowadays. Do you keep your outtakes? How many terabytes of images do you have? How do you back up your images? To the cloud or a external drive? I do try to keep every shot I’ve taken except for some old event photography. I think I probably have about 5 terabytes backed on old external drives. I do redundant backups on multiple external drives and the most important stuff backed up on the cloud. What do you want to be remembered for? Anything else people should know about you or your photography? I want to be remembered for my work, both locally and worldwide. I would like for my best photographs to be remembered as iconic moments in time that I was able to capture, and for these memories to stay with people through their lives. And in the case of those that have purchased my prints, I would love for that memory to be passed on through generations.